Long Island native Michael Massimino completed space shuttle missions and was the first person to tweet from space. Other inductees were aviation developers and the founder of Newsday. Long Island native Michael Massimino remembers being 6 years old when he watched Neil Armstrong take his first steps on the moon. The moment stayed with him, and he went on to become an astronaut on space shuttle missions. On Thursday, Massimino, 55, returned to his stamping grounds to be inducted into the Long Island Air and Space Hall of Fame at the Cradle of Aviation Museum in Garden City. Other new Hall of Fame members are aviation pioneers and developers Louis and Connie Mancuso and Newsday founder Alicia Patterson, who were inducted posthumously. The museum’s executive director, Andrew Parton, described those selected as a deeply impressive group. “We hope the next generation of aviators, engineers and pilots, are inspired by this year’s inductees,” Parton said. Each year, the museum inducts individuals who it says have played a significant role in advancing aeronautical and technological achievement. 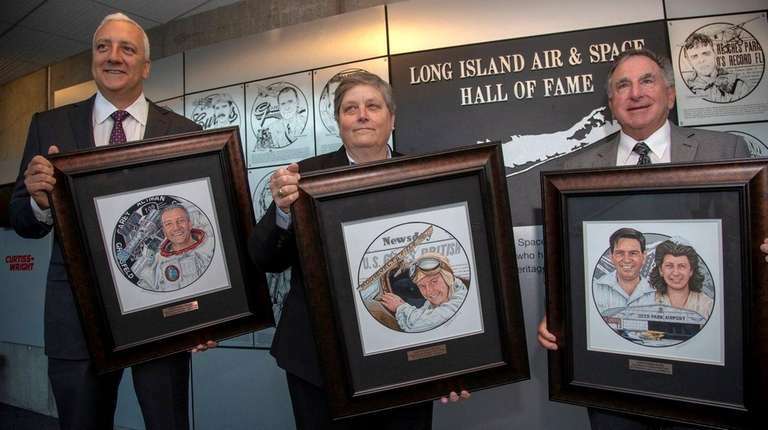 Thirty people have been inducted into the Long Island Air and Space Hall of Fame since its inception 10 years ago, including Charles Lindbergh, Leroy Grumman and Betty Gillies. Massimino, who grew up in Franklin Square, flew on space shuttle missions in 2002 and in 2009, for NASA’s fifth and final repair visit to the Hubble Space Telescope. He successfully completed spacewalks during both missions, and made history in May 2009 as the first person to tweet from space. Massimino spoke of the privilege of being able to view Earth during one of his spacewalks. 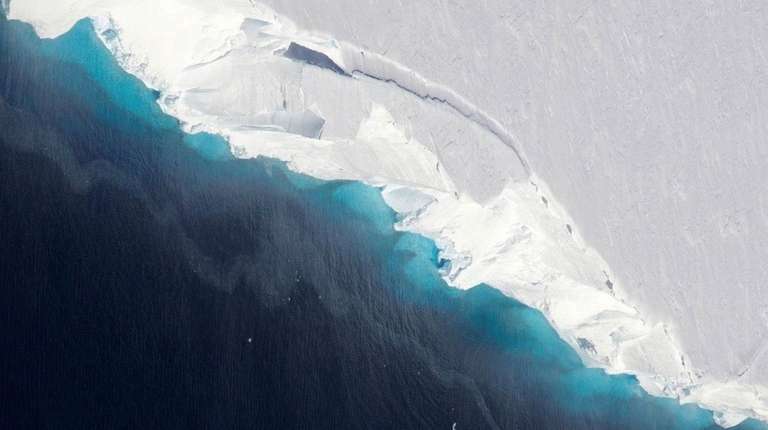 “My first impression, just losing myself in the beauty of our planet was, this is more beautiful than anything people are supposed to see,” he said. Now a professor at Columbia University and an adviser at the Intrepid Sea, Air and Space Museum, Massimino also appears on TV including on “The Big Bang Theory” in a recurring role as himself. Inductees Louis and Connie Mancuso founded Mid Island Air Service, which is now one of the largest flight school operations on Long Island, members of the Mancuso family said Thursday. The couple’s four children attended the ceremony, with Louis Mancuso Jr. accepting the honor on his parents’ behalf. His father became a pilot for the respect that comes with the profession, Louis Mancuso Jr. said. By age 20, Louis Mancuso was a certified flight instructor. During World War II, he instructed Scottish and British cadets in Florida, his children said. His future wife Connie Savino worked as a riveter for Republic Aviation. In 1943, the two wed. In 1946 Louis Mancuso founded Deer Park Airport, which remained open until 1974, and Mid Island Air Service, which is now based at Long Island MacArthur and Brookhaven airports. Louis Mancuso Jr., who serves as president of Mid Island Air Service, said his mother Connie was a strong woman. Alicia Patterson also was known for her skills as pilot, before she went on to found Newsday. According to the museum, she was the first person to communicate via radio from a glider and was the 10th woman to become a licensed transport pilot. In the early 1930s, Patterson set records for flying between cities, including flying from New York to Philadelphia in 40 minutes, the museum said. Patterson founded Newsday in 1940. “She helped pave the way for women aviators and journalists alike,” said Newsday Editor Deborah Henley, who spoke of Patterson’s contributions. Leap again: Astronauts walked on the moon 48 years agoOn July 20, 1969, millions of people huddled around their TVs to watch live as two American astronauts became the first humans to walk on the moon.